This atlasof DiNosAURscanbeusedinseveral ways. The main maps showmajorfossil locations andlist someof the prehistoric animalsfoundthere.Inthepages thatfollow, fii^litier information isgivenforboththe locations and the animals. Finally, if you want to find out more about dinosaurs and what happened to them, you can turn to the section at the end of the book. Color key—the three divisions of the Mesozoic Era are color-coded, so you can see at a glance which period a dinosaur belongs to. The; atlas has six main sections corresponding to the continents (Australia and Antarctica are treated as one). An opening map locates finds, and there are mini-profiles of dinosaurs and other prehistoric animals. Dmcsaue fcssils have been discovered at nearly 300 different -^vllL locations in North America. They are found in the western d^^HHfl interior, the southwest, and the eastern seaboard, in rocks that " formed during the age of dinosauts, from the Late Triassic to the end of the Cretaceous. Throughout these 170 million years, an unknown number of dinosaur species lived on the continent's slowly changing landscape and, so far, paleontologists have identified about 70 different kinds. They belongto all the major dinosaur groups, and several species, such as Tijrannoinuru:., DiplM/itus, and SKgoMMras, are some of the best known dinosaurs in the world. In each of the six main sections, there is an artwork scene. 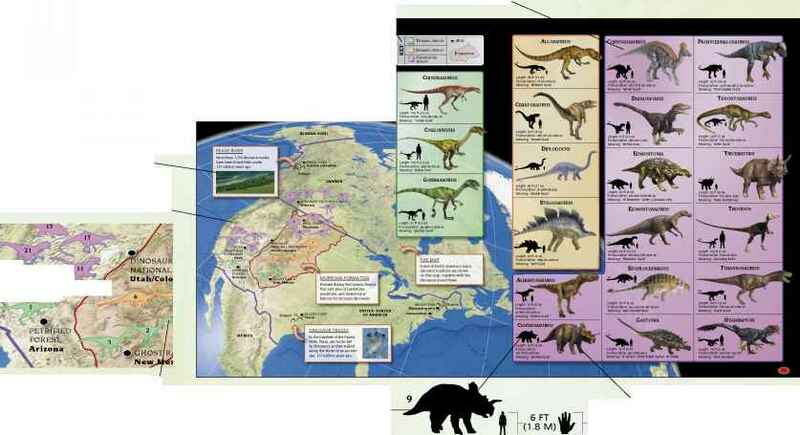 This shows both dinosaurs and other animals of interest. It also shows the environment and what it may have been like at a certain time in prehistory. 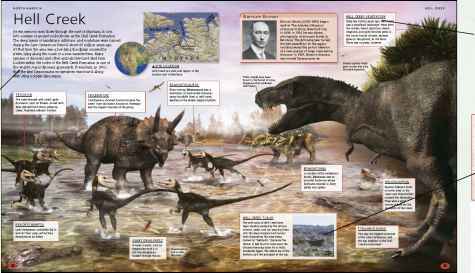 Today's landscape information box helps the reader to compare the present-day world with that of the dinosaurs, and note any differences. The soft rocks of Hell Creek have been steadily eroded by the actions of wind, water, and ice, wearing them into the deep canyons and ravines that characterize the area today. Known as "badlands," (because the terrain is bad land to cross over) the dinosaur-bearing rocks lie in thick, horizontal layers. The oldest are at the bottom, and the youngest at the top. In each of this six sections there is also a transparent overlay page. 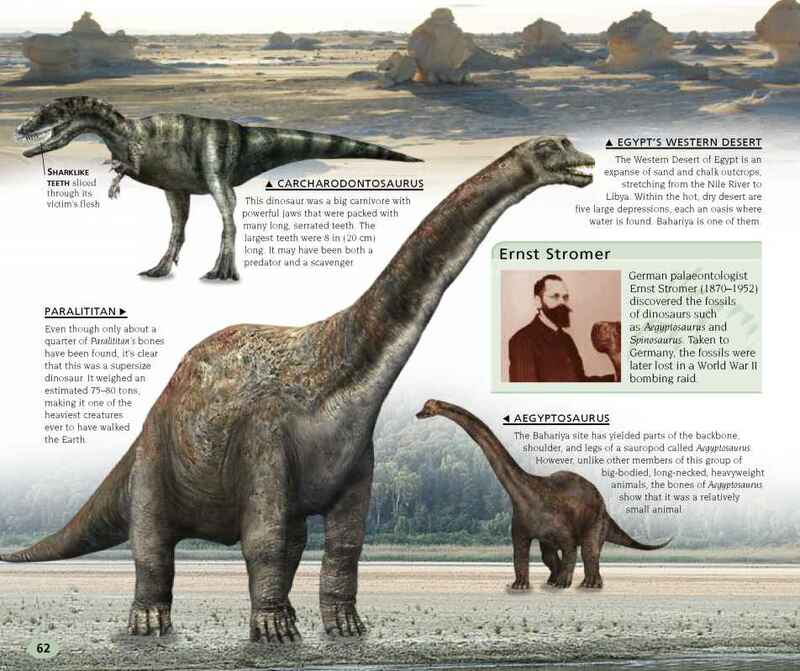 On the page itself, a prehistoric animal of special interest is featured. The overlay provides further information, enabling you to see the skeletal structure. Between 1919 and 1930, Roy ./Chapman Andrews (1884-1960) led expeditions to the Gobi Desert, where he discovered the first-known fossilized dinosaur nests, and new dinosaurs, including Protoceratops. Biography boxes reveal the people behind the finds—by piecing together their fossil evidence, scientists can see how these amazing animals might have looked and lived. Dinosaur tracks and eggshells are also found in the rocks. 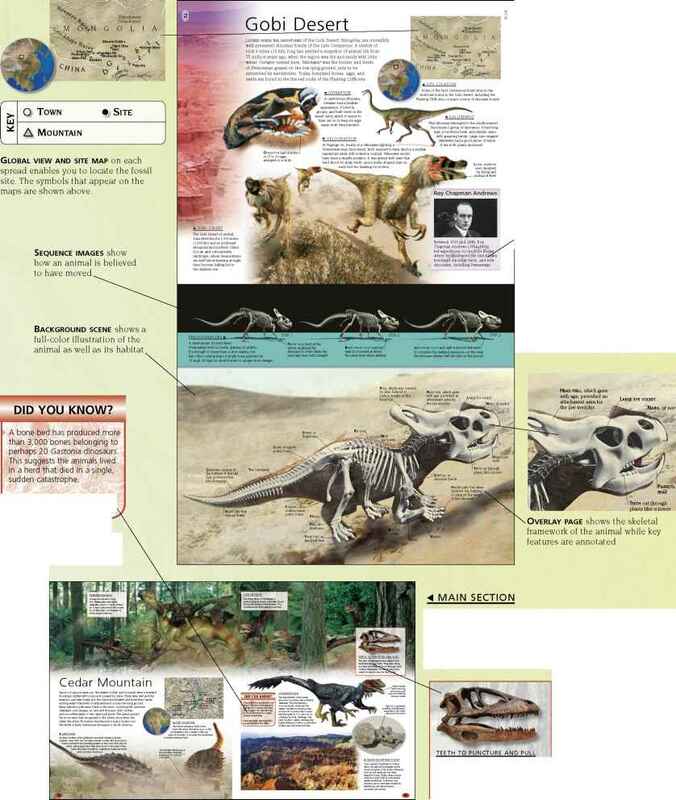 These pages detail selected fossil sites from the given continent, and the prehistoric animals that lived in these areas. They include world-famous locations, noted for their abundance of fossils, or because finds have been made there that have greatly increased our knowledge. The jaws of Deinonychus were packed with backward-slanting teeth. They were sharp, but were not designed to cut through meat. Instead, Deinonychus bit into its prey, then jerked its head to tear the flesh away. Photographs throughout the book show actual specimens, and text captions draw attention to the key features. Did you know? boxes reveal interesting facts about a dinosaur or about a fossil site.